My daughter and my niece (16 year olds!) have a penchant for watching sad movies. They actually seek them out just so that they can have a cry fest at their sleepovers. My daughter is always asking me to join her for a good sad movie, but life has enough sad moments, and I’d much rather watch something that will lift my spirits. After the loss of a beautiful friend this week, I was looking for something to read and in my library found the first book in Kristi Ann Hunter‘s Haven Manor series, Defense of Honor, a book I recently picked up at a yard sale around the corner. I was quickly wrapped up in the story, though I had already read it (I don’t know when!). I was so excited to find the next book in the series in my Bethany House review list and decided to read it today. 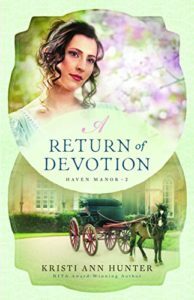 Return of Devotion does not disappoint! The Haven Manor series is about two best friends, Kit and Daphne, who are ousted from ‘society’ after an indiscretion caused in part by mistaken identity that leaves one of them pregnant and the other with a ruined reputation. They decide to turn a bad situation into good by helping other women and their ill-begotten children. For over a decade, the women have lived in Haven Manor, an abandoned country estate that is hidden away in the countryside, helping women hide their conditions and then raising their children. Unfortunately, the owner of the home has died and his son unexpectedly decides to actually live in the forgotten estate, which leaves a dozen children and three women (the mysterious, ex-spy Jess has recently joined the group) in quite the quandary! 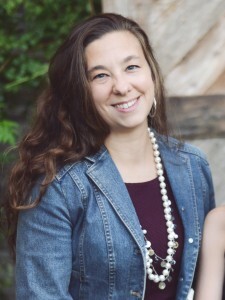 Fortunately, one of the women, Kit, and her husband, Graham, have decided to take the endeavor to the next level by finding homes for the children so that they can be raised in a real family. (You’ll have to read Defense of Honor to hear Kit and Graham’s love story and to find out how they decide to work together in this cause!) They find homes for the younger children, leaving five, including Daphne’s own son Benedict, on the estate while Kit and Graham embark on their wedding trip. Daphne and Jess pose as the housekeeper and the cook, while the children (aged 9-13!) are given jobs as maids, etc. Poor William, the new Marquis of Chemsford, has no idea what to think when he arrives on this supposedly abandoned estate and finds a very unconventional arrangement and quite the strange reception. What he doesn’t know is that Daphne’s son, Benedict, is a mirror image of William. Daphne immediately sets out to keep the two apart to protect the secrets of the manor…and her son. Despite his confusion and annoyance, William finds himself drawn to his ‘housekeeper’ Daphne and is compelled to uncover her secrets. As the book unfolds, both Daphne and William must discover who they truly are and decide what they are meant to do. The outcome of an unlikely situation is a beautiful resolution to the story. I highly enjoyed reading Daphne and William’s story. Their unconventional romance has some wonderful laugh-out-loud moments, and readers get an intimate peek at the hearts of these main characters who set out to do some good in the world. I can’t wait for the next installment of the series! PS I received a free e-copy of this book from Bethany House in exchange for my honest review.